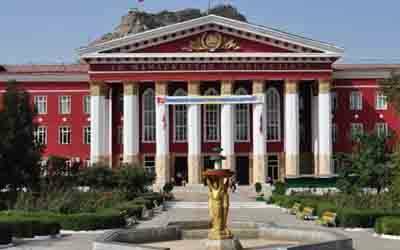 Osh State Medical University was established on 24 May 1951, it is currently one of the best destinations for the students who want to pursue their dream of getting their MBBS degree in and around Kyrgyzstan. Osh State Medical University is considered as one of the most modern and well recognized Institute teaching medicine in the Eurasian region. Currently, more than 3600 students are pursuing their medical training in Osh State Medical University. Out of this number of 3600 students more than 600 students are from the foreign countries of Kyrgyzstan such as India, Nepal, Pakistan, Uzbekistan, Turkey, Turkmenistan, Palestine, Iran, and Syria. Education provided to the students is in two languages – English and Russian. So far Osh State Medical University is successful in training students from more than 20 different countries at least. Overseas students are getting their education from International Medical faculty in English and students from Kyrgyzstan study at the Medical faculty of Osh State University in Russian. The tuition fee is paid in local currency (Kyrgyz Som). Tuition fee settled with US dollar / Kyrgyz Som exchange rate is provided below. As Osh Medical University provide almost all the courses in two different languages- English and Russian. Therefore the course language affects the tuition fees. Students have to pay 2,400 US $ per year as tuition fee. Students have to pay 1600 US $ per year as tuition fee. As the course is only available for the local students, the course is only available in Russian language and students have to pay 1,600 US $ per year as tuition fee. If the students get the facility of Government hostel students have to pay 200 US $ per year as the hostel charge.